Poinsettias are the most common flower for the holidays, and every grocery store offers a poinsettia wreath that you can hang on your front door during December. Being the papercrafters that we are, we decided to design our own paper poinsettia wreath. We used our floristic crepe poinsettias to create a stunning door wreath that you can keep for years to come. You will start your wreath by crafting your crepe poinsettias. Get the floristic crepe in our shop, then head over to our Craft School lesson to find the template and video tutorial to make the poinsettias. You will also see your materials list on the lesson page. After you finish the flowers, you will need a wreath form, which you can find at your local craft store. 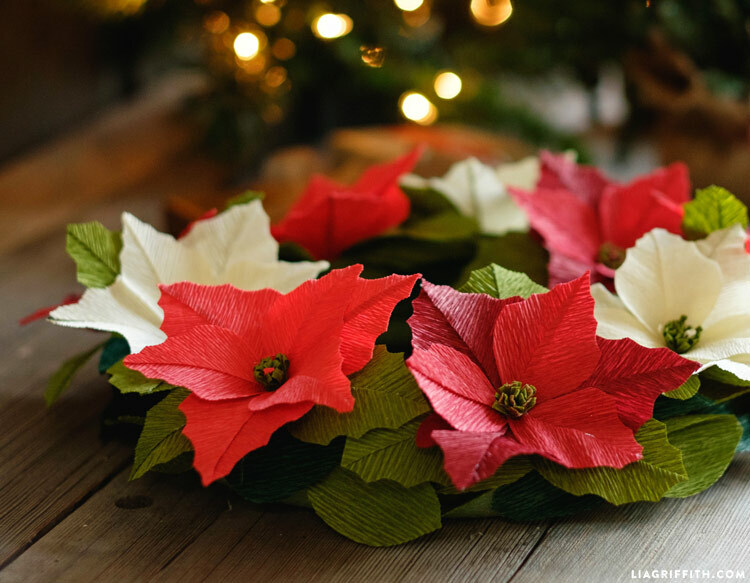 To assemble your paper poinsettia wreath, simply stick the floral wire stems into the form. We left our stems about 2 inches long. You can also secure with hot glue after orienting the poinsettias. Because the poinsettias are large blooms, you can make a wreath with just these flowers, like you see in our photos. 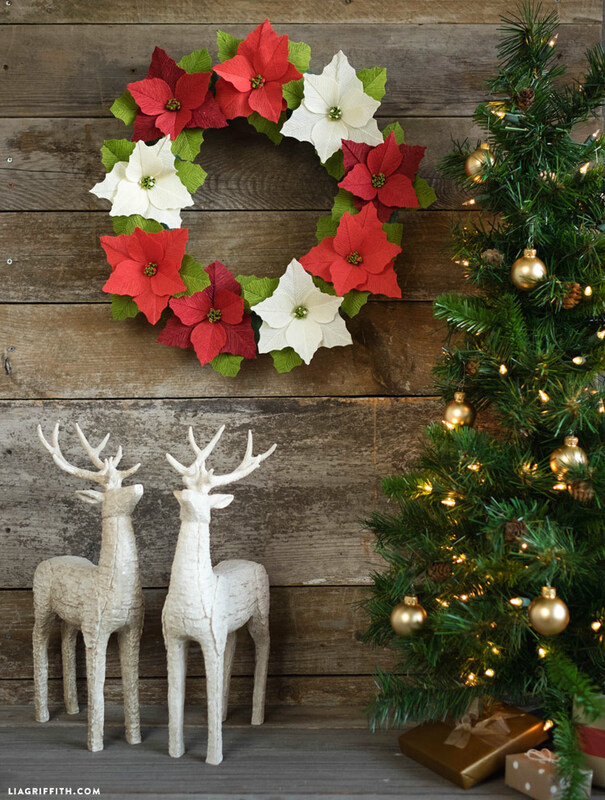 If you prefer a paper poinsettia wreath with fewer blooms, you can fill it out with the pretty leaves from our magnolia leaf wreath. Browse the rest of our wreath options on the site for more variety, including our felt holly wreath or our paper evergreen wreath. 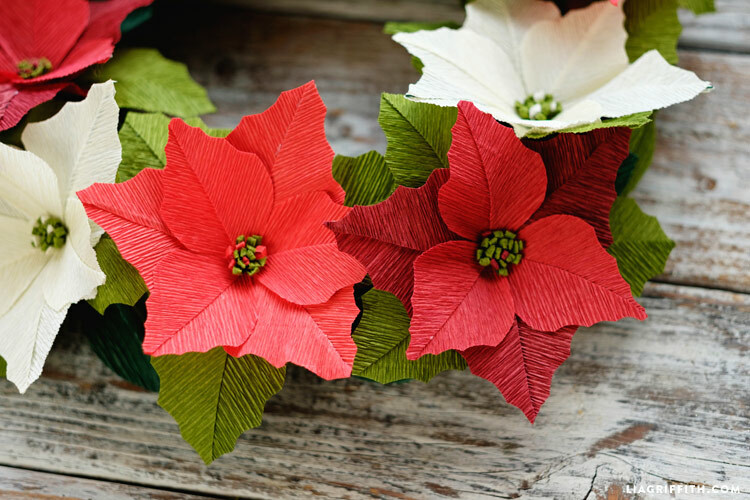 Watch our crepe paper poinsettia video tutorial! Can you make the poinsettias using extra fin crepe? What size wreath form do you need for this ? It’s hard to tell in a picture ! Can your holiday crepe paper be cut with a Cricuit Air machine? And are you going to make these images in an SVG format? Hi Bobette! Sadly we haven’t found a way to cut crepe on the Cricut– it’s just too delicate! Our crepe patterns don’t translate to SVG cuts but we will be sharing a new poinsettia SVG very soon. 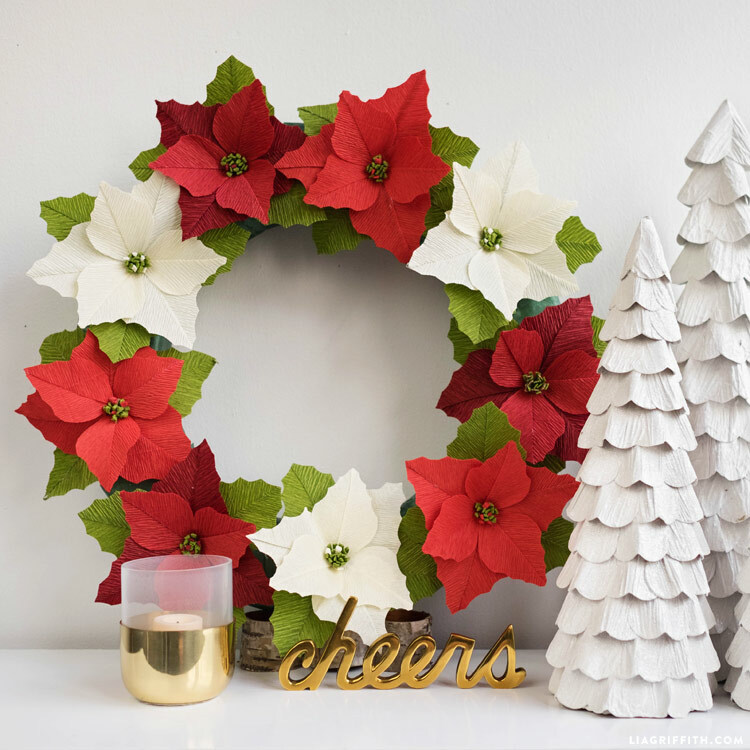 Just ordered my paper so i can’t wait to make these gorgeous poinsettias but i LOVE those white trees shown just to the right of the poinsettia wreath — are there directions on how to make those?? I have never made flowers before, but I’m afraid I’m “hooked” before I even get my supplies! I only have created cards and love that too, Thanks for being so creative so all of us can learn and achieve some beautiful projects with your help. Thanks for all the inspiration and tell Janice I appreciated all her online help! Yay Sue, I’m so happy to hear this! We are inspired by people just like YOU who are excited about our products and crafting.